Here Come the Boys tickets at Adelphi Theatre, London. 2019. Find the best Here Come the Boys dance or ballet tickets at Adelphi Theatre, West End. 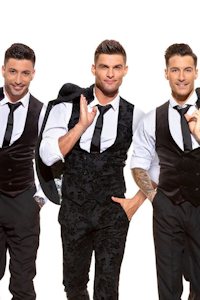 Three of the biggest rock stars of dance, Aljaz Skorjanec, Giovanni Pernice and Gorka Marquez, battle each other in Latin, Ballroom, commercial and contemporary, and they need you to decide the champion! From J.Lo to Bruno Mars, MJ, Gloria Estefan, dance anthems and club classics! Accompanied by a live percussionist and flamenco guitarist, with live vocals from Elizabeth Troy (formerly with Clean Bandit). Performers Alijaz Skorjanec, Giovanni Pernice, Gorka Marquez. Director Gareth Walker. Choreographer Gareth Walker. Choreographer Janette Manrara. Here Come the Boys tickets: The tabs above allow you to select between links to suppliers and date searching. Click on a supplier's logo to see their details and on the 'buy now' button to see and check the tickets on offer.